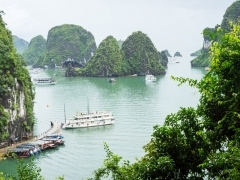 No trip to Vietnam will be complete without a visit to Halong Bay. Known as the UNESCO World Heritage Site, Halong Bay appeals to world-wide tourists by its picturesque natural scenery. The Bay is endowed with a cluster of limestone islands and islets rising from the sea in a variety of shapes and sizes & a large number of magnificent caves and grottos with impressive stalagmites and stalactites.